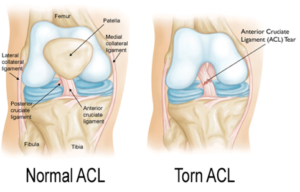 Anterior Cruciate Ligament (ACL) tears are one of the most common knee injuries suffered by athletes, but they are significantly more prevalent in young, female athletes. I would know…I have torn both of mine. As a NCAA Division I volleyball player, I worked my way up the ranks from playing in high school, at the club level, and even at a junior college. Never once was I screened for deficits that could lead to a catastrophic injury like an ACL tear. Maybe if I had, I would not have needed 5 knee surgeries total, including two ACL reconstructions. The ACL attaches from the posterior (back) of the femur (thigh bone) to the anterior (front) tibia (shin bone), and its main purpose is to limit anterior translation (forward gliding) of the tibia. It also helps to limit excessive internal and external rotation (turning) of the tibia. Thus, the main mechanism of injury for an ACL tear is the hyperextension of the knee causing anterior translation of the tibia combined with a rotational force…often seen when an athlete plants their foot and pivots simultaneously. Why do young female athletes suffer ACL injuries four to six times more often than their male counterparts? There is a biomechanical angle measured through the hip and knee called the “q-angle” that shows the relationship between the hip and knee. Females have a larger q-angle because we tend to have a wider pelvis than males. The wider pelvis causes a more valgus orientation of the knee (see the picture below). That valgus orientation puts significant pressure on the medial (inside) of the knee and ultimately changes the biomechanical efficiency of the knee joint itself. The increased valgus forces put excess pressure on the stabilizing ligaments in the knee, like the ACL, and increase the natural rotation of the knee. There is evidence that also contributes a lack of core stabilization ACL injuries. Decreases in core neuromuscular control can increase uncontrolled truck displacement which leads to higher knee ligament strain and ACL injury. A good way to identify athletes at risk of an ACL injury is to do a screening test, such as the Tuck Jump test. This test requires the athlete to complete repetitive tuck jumps (jumping while tucking the knees toward the body) over the course of 10 seconds and the person screening should look for the athlete’s tendency to land with their knees in a valgus orientation which identifies a neuromuscular imbalance that needs to be addressed. The increased valgus orientation of the knees is often caused by the increased firing of the quadriceps and decreased activation of the gluteal muscles. A great way to reactivate the glutes is to perform the exercise below. Hip Bridge with Resistance Band: Begin by lying on the floor with knees bent and feet flat on the floor. Place a resistance band around the thighs just above the knees. Slightly abduct the legs (separate the knees) while simultaneously performing a hip bridge (bringing the hips off the ground). Slowly lower to start position without bringing the knees together. Perform 3 sets of 10 repetitions. A valgus collapse of the knee can also be contributed to weak hip abductors and external rotators, like the gluteus medius. Performing the clamshell exercise will help strengthen those muscles. Clam Shell with Resistance Band: Begin by lying on the side with knees together and bent at 90 degrees with the resistance band around the knees. Lift the top knee upward while keeping the feet touching. Continue lifting the knee to the point just before the pelvis begins to move. Lower the knee back to the starting position. Perform 3 sets of 10 repetitions with each leg. 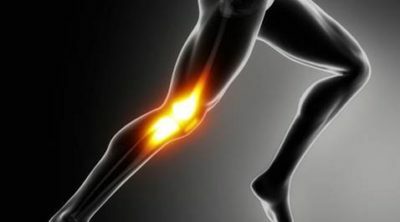 The hamstring muscles work with the knee to help counteract the contraction of the quadriceps and prevent excess anterior translation of the tibia. The stability ball leg curl exercise helps activate the hamstrings while also activating the core muscles. 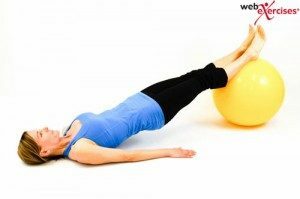 Stability Ball Leg Curl: Begin lying face up with arms extended at your sides and ankles on top of the stability ball. Active core and form a bridge position. Then flex your knees, bending your legs as you draw the ball inward. Reverse the movement, extending your knees, and return to the start position. Perform 3 sets of 10 repetitions. Lateral stability plays a large role in the ability of the female athlete to control lower extremity alignment. “Monster Walks” are a great way to boost lateral stability. “Monster Walks”: Begin standing with a resistance band around the thighs just above the knees. Keep your feet and ankles apart enough to put resistance on the band. Perform a ¼ squat with both feet supporting your body weight. Hold the squat position, shift weight fully onto one leg. Take a lateral (sideways) step with the un-weighted leg. Repeat, taking several lateral steps in one direction and then doing the same in the opposite direction. Yet another potential risk for ACL injury comes when landing with knees bent less than 45 degrees. Therefore, landing training is a very important part in injury prevention. Long Jumps to Backward Hop: Begin in ¼ squat position. Jump forward in an explosive long jump trying to “stick” the landing for 3-5 seconds. Make sure the knees are flexed to approximately 90 degrees on landing. Hop backward two or three times returning to the start position. Perform 3 sets of 10 repetitions. If the athlete is unable to “stick” the landing with toes straight ahead and no inward knee motion, then regress them to submaximal jumps of a shorter distance until perfect technique can be attained. Incorporating high-intensity plyometric jumping exercises into a training plan has been shown to significantly reduce the incidence of ACL injury. Performing split jumps gives these plyometric benefits. Split Jumps: Begin in a split stance lunge position with arms raised at shoulder level. Jump upward and quickly reposition the legs and land with feet in opposite positions. Raise arms while you are jumping. Continue jumps by alternating leg positions. Perform 3 sets of 10 repetitions. If the athlete fatigues to the point where she cannot perform the exercise perfectly, she should be instructed to stop. Be sure to record the duration of each completed exercise with the goal of the next training session to continue to improve technique and increase volume and intensity. Also, repeat the screening test every few weeks to determine progress. Give the athlete feedback with verbal cueing before and after training so they can make the necessary changes for improvement. It is imperative to include a core stabilization program with the above training exercises to create a well-rounded program and reduce the risk of injury from all angles.